Business Valuation and Bankruptcy helps you-whether you are an accountant dealing with a troubled company, a lender, an investor, a bankruptcy and restructuring lawyer/financial advisor, or a private equity player-to focus on solving everyday and case determinative disputes when creditors, lenders, and debtors have differing views of value. 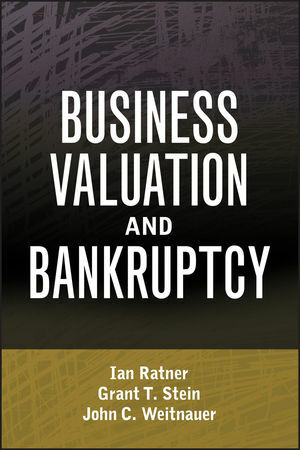 Business Valuation and Bankruptcy is written in terms that are common to bankruptcy professionals and is essential, timely reading for players in the bankruptcy and restructuring environment. IAN RATNER, CPA, ABV, ASA, CFE, of GlassRatner Advisory & Capital Group LLC, is a nationally recognized financial advisor, focused in the area of forensic accounting, litigation support, business valuation, and bankruptcy consulting. He has a proven track record as an expert advisor and has led high-profile and complex assignments including failed transactions, SEC investigations, financial reporting frauds, large corporate bankruptcies, and countless commercial litigation matters. In many of these cases, he is asked to decipher contradictory valuation opinions and testimony by getting behind the numbers relied on by others. Ian has testified as an expert on dozens of occasions in state and federal courts in various jurisdictions around the country. GRANT T. STEIN is partner in the law firm of Alston & Bird LLP in the Bankruptcy, Reorganization and Workouts Group. He is a Fellow of the American College of Bankruptcy, Chair and past president of the Southeastern Bankruptcy Law Institute, and is identified as a top practitioner in Chambers USA: America's Leading Lawyers for Business, The Best Lawyers in America, and Super Lawyers magazine. During his more than twenty-five years of practice, he has amassed extensive bankruptcy and litigation experience dealing with valuation questions. JOHN C. WEITNAUER is a partner with the law firm of Alston & Bird LLP in the Bankruptcy, Reorganization and Workouts Group. In 2006, he was co-trial counsel for plaintiffs in a jury trial that involved many business valuation issues, and obtained a verdict stating that over $965,000,000 in transfers were made with the actual intent to defraud the plaintiffs, with $350,000,000 in punitive damages. He has been included in The Best Lawyers in America reference books since 1995. He is profiled in Chambers USA: America's Leading Lawyers for Business. He is a Contributing Editor of two bankruptcy treatises, Norton Bankruptcy Law and Practice and the Bankruptcy Litigation Manual.